Cliff Industrial delivers exceptional precision wire electrical discharge machining services (EDM Wire Machining), producing high quality parts that match your exact specifications. We can cut even the hardest metals into precise, intricate shapes that would be impossible to achieve using conventional methods. Wire electrical discharge machining is an advanced manufacturing process that employs a single-strand of metal wire that acts as a tool-electrode. This wire creates an intense electrical field of spark that erodes material on the work piece with great precision. CNC EDM is a stress free form of machining since there is no direct contact between the element and the work piece. Any material that can conduct electricity can be machined with wire EDM, even hard metals like tungsten carbide, titanium and stainless steel. At Cliff Industrial we manufacture our own tooling and can cut a variety of part sizes up to 33.5″x19.7″x7.88″ weighing up to 1.100lbs. We work with wire sizes that range from .098″ for small precision work to .010″ for large work pieces. In addition to the incredible versatility and accuracy, our advanced CNC equipment makes EDM wire machining one of the most cost effective manufacturing options available. We provide our customers with the quick turnaround times and on time delivery they require. Projects typically require a lead time of only 1 – 2 weeks. We also offer a comprehensive selection of secondary services including heat treating, descaling, haperizing/centrifugal finishing, anodizing, and hard coating. Wire EDM machining has revolutionized the manufacturing process, making it possible to create intricately cut pieces to exact specifications. Cliff Industrial is a leader in manufacturing high quality CNC EDM produced parts. Our customers know they can depend on us to deliver a product on schedule that meets their precise specifications and standards. We have an excellent reputation for producing parts to the exact standards you require at cost effective prices and quick turnaround times. 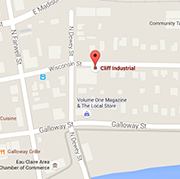 Contact our direct customer service for more information about Cliff Industrial’s precision wire EDM capabilities. Let us discuss your project requirements, give us a call at 715-835-8314.